1944-1997. — 1 cm of textual records. — 56 photographs. — 1 maps. Daniel Rycroft was born in Spirit River on October 24, 1924 to Helen and Robert Henry Rycroft. In 1928 the family left the area to eventually reside in Smoky Heights where Danny took all of his school. In November 1942, shortly after his eighteenth birthday, he enlisted in the RCAF. He was on duty overseas in 1944 when he was reported missing in action. A month later his mother received news that he was alive. His plane had been forced down but he had bailed out and had been taken in by a French family. The French underground were able to assist his return to England where he was hospitalized for a fractured spine and ribs. After returning home, he married Violet Spry in May 1945. They raised a family of six children: Loraine, Greg, Bill, Neil, Jean, and Jack. Danny became a grain buyer for National Grain Co. and then Alberta Wheat Pool for eighteen years. In 1974 he went to work for the County of Grande Prairie. Danny Rycroft died on April 13, 2011. The records were donated to the South Peace Regional Archives by Danny Rycroft in 2008. The fonds consists of written memories of Danny’s war time career during WWII and his return visit to France in 1997, 56 photographs from two of his albums, (1942-1997), a silk map of Europe, a CANADA badge, and a poster of a replica of a Lancaster Bomber. Series 292.01 Danny Rycroft Personal Stories. — 1944-1997. — 1 cm of textual records. — 1 maps.The series consists of copies of stories and documents related to Danny’s WWII experience with the RCAF. Included is a silk map and a CANADA badge from his uniform. 1 silk map, 2 sided; 72 x 72 cm. The silk map (worn as a scarf) contained details of roads, terrain and borders through Belgium, Germany, France, Holland, Switzerland. It helped airmen who survived being shot down find their location and try to make their way to friendly territory. Series 292.02 Photographs. — 1944-1997. — 56 photographs.The series consists of 56 photographs related to Danny’s WWII experience and his reunion with the French family who harboured him after his plane was shot down in 1944. 1649 R.C.A.F. – World War II fighter plane. 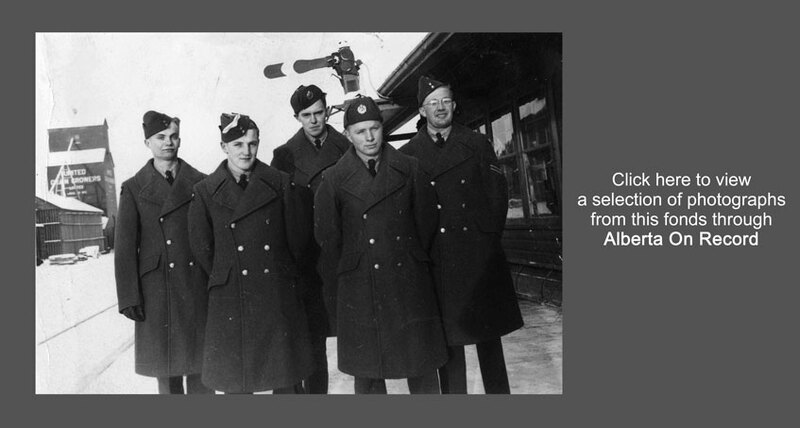 Local Boys Who Enlisted, 1944 c.
“Local ” boys who enlisted in the Royal Canadian Air Force. Original Crew of Five, 1944 c.
R.C.A.F. – Original crew of five, Danny Rycroft is second from the right. Home on Christmas Leave, 1944 c.
Crew from First Course, 1944 c.
Royal Canadian Air Force Crew on their first course. Sam Rycroft ( Dan’s brother) is front row second from left. Quebec graduation as Air Gunners. Danny Rycroft is third from the left. Bob and Bill Bessent twins. September 16, 1944 of Dan in front of the Lancaster that crashed August 25, 1944. Boult-Aux-Bois village next to Belleville-Sur-Bar. Burial Place of 7 Crew Members, n.d.
Arial photograph of the cemetery where 7 of the crew members from “S” crew were buried. Cemetery is between Boult-Aux-Bois and Belleville-Sur-Bar. Grave Markers for the Crew of Seven, n.d.
Photographs of the original grave markers and grave site for the 7 crew members. Rene Bocquet July 6, 1959 (Robert and Germaine Bocquet’s son). The Bocquets hid Danny Rycroft after his plane crashed in France. Rene Bocquet (Robert and Germaine Bocquet’s son). The Bocquets hid Danny Rycroft after his plane crashed in France. Children Placing Flowers on Graves, 1950 c.
Local children putting flowers on the graves of the 7 crew members. (From left) Germaine Bocquet, Dan Rycroft, Robert Bocquet in Bellville-Sur-Bar, Septmber 1944. From left : Robert Bocquet, Dan Rycroft, Dr. Rene ? , Germaine Bocquet, in Belleville-Sur-Bar. Bocquets house in Belleville-Sur-Bar where Dan Rycroft was hidden in 1944. Upstairs window shows the room where Dan was hidden. From left: Yvetter Garrer, Amie Marie Moffit, Denise Debourer (Mayor’s daughter). Danny Rycroft (center), with Germaine and Robert Bocquet September 19, 1944, right before Dan left to England. Photos of Dan Rycroft with local residents. Lady is Denise (Mayor’s daughter) and a Polish Jew and her husband that were also been hidden. Photographs of young men from Belleville-Sur-Bar that were given to Dan Rycroft. Neighbor from Bault-Aux-Bois, Germaine Bocquet, Dan Rycroft and Robert Bocquet. Cous family from England who went back to France to visit the graves and sent Dan Rycroft pictures. David Jones and Family, n.d.
David Jones and his family. Will Nesbit’s Wife, 1944 c.
Chris Nesbit, wife of Will Nesbit. Friend of Chris Nesbit, 1944 c.
Betty, friend of Chris Nesbit. Chris Nesbit and her Sister, 1945 c.
Chris Nesbit and her Sister after the war. Chris Nesbit after she remarried. Graduation class, Jack Spry front row middle. Danny and Fellow Airmen, n.d.
A couple of Danny’s airmen friends and a group of four of them. Front Row: Bill Bessent, Danny Rycroft, Bob Bessent. Back: Dave Pickering. November, 1942. Gordon Rycroft, Ted Murray ready to enlist. Ted Murray was too young and was sent home. Ken Nelson, Gordon Rycroft, Allen Tink come home for Christmas. Will and Chris Nesbitt on their wedding day. Ken Nelson, Violet Spry, Gordon Rycroft, Jean Mc Kenzie, Allen Tink, and Margaret Mc Kenzie stand in front of a car on Sexsmith main street.